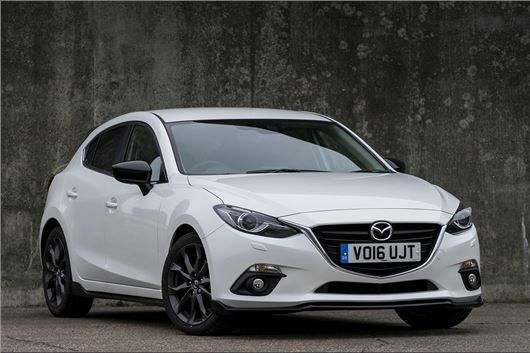 Mazda has launched a new special edition variant of the Mazda3, called the Sport Black. Available from April 1 at £20,995. It’s available with the 120PS 2.0-litre petrol engine and six-speed manual transmission only, and is painted in either Soul Red or Snowflake White Pearlescent. 800 will be sold in the UK. The Sport Black features various glossy black exterior details including the front splitter, side skirts, mirrors and details on the bumpers. Inside, the seats are trimmed in a mix of black leather and suede, plus there is a BOSE surround sound audio system, a reversing camera, keyless entry, cruise control and integrated navigation. The solitary, 2.0-litre petrol engine choice is good for 0-62mph in 8.9 seconds, with emissions of 119g/km and official economy of 55.4mpg. Peak torque is 210Nm at 4000rpm and peak power is 120PS at 6000rpm.